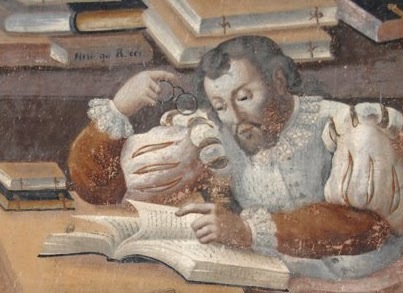 An unknown early modern reader with spectacles. High Mixteca Region, Oaxaca, Mexico, 16th century fresco. Without a doubt, glass is a true fruit of the art of fire, as it can so closely resemble all kinds of rocks and minerals, yet it is a compound and made by art. In the fire, it fuses and becomes imperishable. Indeed, like the perfect shining metal gold, the fire refines it, polishes it and makes it beautiful. Countless other types of vessels are invented every day to compose and produce elixirs, secret potions, quintessences, salts, sulfurs, vitriols, mercuries, tinctures, elemental separations, all metallic things and many others that are discovered daily. Also, glass containers are made for acque forti and acque regie,** which are so essential for refiners and partitori [masters in royal mint] to purify gold and silver and to bring them to perfection. So many benefits for the service of humanity come from glass, which seem nearly impossible to make without it. We can see in it and in any other thing the great providence of God that has put glassmaking materials so abundantly in every place and region, so that something of such great use to humanity can be made with such facility for all. Glass is also a great ornament to God's churches since, among other things, many beautiful windows are made adorned with graceful paintings in which the metallic colors are so intense and vivid that they seem like so many oriental gems. In the furnaces, glasses of many colors are formed with so much beauty and perfection that it seems no material like it can be found on earth. We can suppose the invention of glass is very ancient since the Holy Scripture says in The Book of Job [28:17], "gold and glass shall not be equal to it [wisdom]…", which gives clear evidence that glass was invented in antiquity. Saint Jerome held that Job descended from Abraham, and was the son of Zanech, who descended from Esau and therefore was only fifth from Abraham. There are many who attribute the invention of glass, and perhaps with some reason, to the alchemists; wanting to imitate jewels, they discovered glass. This may not be too far from the truth; I show clearly in book five of the present work, methods to imitate all the jewels, in which we see the vitrification of stones that never could fuse and vitrify by themselves. Pliny indicates that glass was discovered by chance, in Syria [now Israel], at the mouth of the Bellus [now Na'aman] river by certain merchants pushed off course at the whim of the sea. They were forced to stop there and set up camp. In order to eat they built fires on the beach, where there was a large amount of that kind of herb that many call kali, whose ashes make soda and rocchetta. This burned in the fire, its ashes and salt reacted with the sand and with the stones suitable to vitrify; these materials changed into glass. 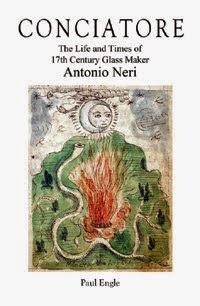 This event illuminated the mind of man on the means and manner to make not only glass, but cristallo, cristallino and many other beautiful things made with glass. Also, it is taught that in the time of the Roman Emperor Tiberius, a way of making glass malleable was invented, a thing that was subsequently lost and today is hidden to all. Indeed, if such a thing were to be known today, without any doubt it would be more valued than silver or gold for its beauty and incorruptibility, since glass does not give rise to rust or taste or smell or any other [adverse] quality. Furthermore, it provides great value to humanity in the use of reading spectacles and [reflecting] spheres. Even though the former may also be made of natural rock crystal, also known as mountain crystal and the latter with the alloy known as steel [bronze], a composition made of copper and tin, nevertheless, in the one as well as the other, glass is better suited, not nearly as expensive, more desirable and more effective, especially with [reflecting] spheres. Beyond the difficulty and expense in making them, they do not image as vividly as the glass and what is worse, in a brief time they fade, not reflecting anything at all. For these and many other reasons, we can easily conclude, glass is one of the most noble things on earth that humanity has today for its use. Since I have labored in the craft of glassmaking for a long time and seen many things, I am moved to report to the world part of that which I have seen and done in it. Although the methods to make salts, bollitos [salts for cristallo] and frits are well known to many, it still seems to me that this is a matter requiring clear and distinct treatment, which I do with observations and diligence. Moreover, if my work is well considered it will not be judged altogether useless, indeed, perhaps even necessary and enlightening. Besides, with my particular method of extracting salts to make the noblest cristallo, the artisan who is diligent in doing things the way I, with clear demonstrations, reveal and teach, will make things as worthy, appealing and noble perhaps as anything made today or that can be made in any other way. In this and every other matter that I deal with in the present work, the diligent and careful craftsman will find that I have written and shown the truth, not as I was told or persuaded by any person whatsoever, but as I actually did and experienced many times with my own hands. I have always possessed the resolve to write and to speak the truth. If anyone trying my recipes and methods to make the colors, pastes and tinctures does not succeed in making what I have described, do not reject my work or think I have written lies, but reflect upon where he may have erred. Especially those who have never before handled such things, because it is impossible on the first try to have the ability to be a master. That being the case, repeat the work so that it will continuously improve and ultimately be perfect as I describe it. Be warned in particular to give careful consideration to the colors for which exact and determined amounts cannot be given. Indeed, with experience and due practice learn and with the eye and judgment know when a glass is colored sufficiently and appropriately for the work at hand. With paste made for the imitation of jewels, in determining the size that you want to make, bear in mind that those to be set in gold with foils as for rings and other similar applications should always be more transparent. Those that are also set in gold, but are intended to hang in the air, as earrings and similar items, require a greater charge of color. All of this is nearly impossible to teach, but must be left to the judgment of the careful artisan. Keep in mind also to be meticulous so the materials and colors that you make are well prepared and well ground. To ensure that materials slated for exquisite work are beyond question, prepare and make the colors personally the same way as I teach and to that end you can be confident of good work that will come to fruition happily. The fire in this art is of notable importance. Indeed, this is what perfects everything and without which nothing can be done, therefore give it in a proportionate way. In particular, use hard dry wood, being careful of harmful smoke, which always causes damage, especially in the furnaces, where pots and pans stand open and the glass could become imbedded with specks causing imperfections and notable ugliness. In closing, I say that the artisan who is or becomes diligent, practical and works step by step, as I describe, will find truth in the present work. He will find that I have published and given to the world only as much as I have proven and personally verified through experiment. If the world acknowledges my arduous efforts, as I hope, I will perhaps also be encouraged to publish the experience of my endeavors over many years, working in various parts of the world, in the chemical and spagyric arts. Known and perfected in the ancient times, I believe there is no greater thing in nature in the service of humanity. Men who became experts in these arts were thought to be gods and were esteemed and revered. I will not enlarge on this matter [glass] since I have described every last detail clearly and distinctly in this work. I am sure that if you do not purposely foul up, it will be impossible to fail, after having acquired experience and practice. Therefore take what I have to offer in good course, as I have candidly written this work, first for the glory of God and then for the delight, benefit and utility of all. * A more detailed treatment of the translation of these terms can be found in the post dated 27 December 2013. ** 'Aqua fortis' and 'aqua regis' Neri uses the plural forms, so I have kept his italian.